The Rooney Punyi Reading Show is a fun, fast paced show chock full of audience participation, books, twisted fairy tales, singing, and lots of laughs! Maureen Rooney and Paul Punyi have been delighting young audiences for over 25 years. These high energy, interactive reading shows send a great message to kids, that reading is fun! 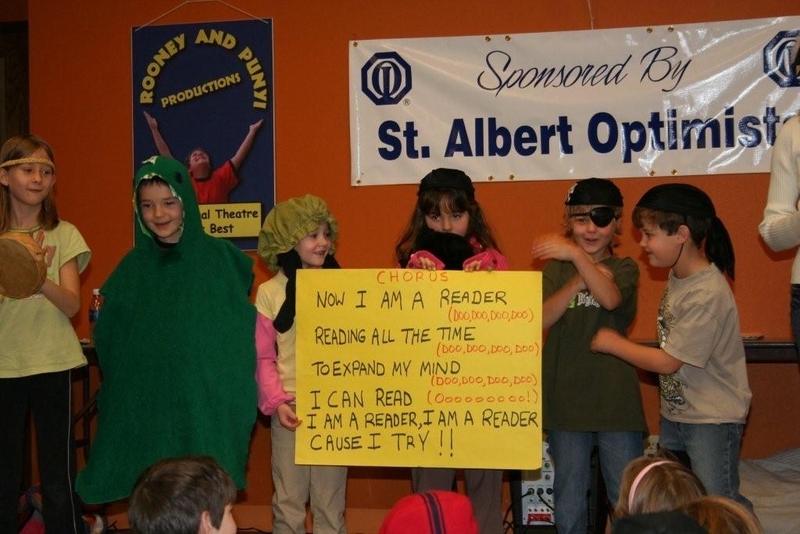 The St. Albert Optimist Club has sponsored 20 Rooney Punyi Reading Shows every November since 1994 in partnership with the St. Albert Public Library. Here are some of the key things you need to know. 50 min. Shows for Kindergarten – Grade Six. School must provide two microphones and 4 chairs for the performers. Parents will love the show too, so invite them. The show begins quietly with a story. The choices vary. Then the teachers help with a high energy and very silly sing-a-long. The songs vary. Then we perform a reader’s theatre, twisted fairy tale. These vary from year to year with about 6 different versions to choose from. These really create a huge amount of laughter. The grown-ups will laugh along with the children and it is our hope that the students will want to grab a book once they get the message that readers have fun, and that READERS ARE DOERS! There is a new Rooney and Punyi Reading Show created each year! See a different show every year and make it a school tradition!